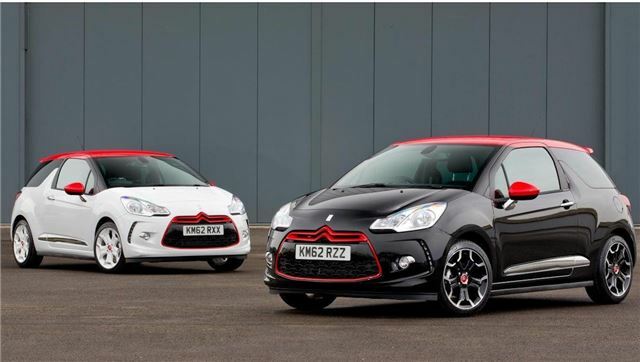 Citroen's popular DS3, on sale since 2010, gets a boost with the addition of a series of special editions. The 'Red' editions are based on the DSport and DStyle models and receive a selection of styling tweaks plus additional equipment - prices start at £15,655. All DS3 Red models feature ‘Red Touch’ interiors and exteriors.This means it's a step back to the '80s, with red roof and mirrors, as well as matching inserts for the radiator grille and surround. Bold 16 or 17-inch wheels in red or black finish off the effect. The DS3 DStyle Red gets Citroen’s ‘Connect Signature’ - that's Bluetooth and USB connectivity in plain English, while the DSport Red gets a ‘City Signature’ pack. Automatic headlights and wipers, rear parking sensors, electric heated and folding door mirrors, an electrochrome rear view mirror, interior mood lighting and a front central armrest are all included. Styles are available in petrol or diesel - VTi 120PS and the e-HDi 90PS respectively. The latter emits 98g/km of CO2. The Sport gets more power - 155PS for the petrol, and 115PS for the diesel - all with six-speed gearboxes. All models are on sale now.